Orange County, CA – Annabelle Lockwood makes the best homemade lemonade around Fountain Valley. Using her grandma’s recipe, a homemade stand built by her father and a lot of passion, she serves the gourmet refreshments – classic or pink lemonade, and flavors like peach, blueberry ginger and watermelon – to eager customers and charitable events. But her passion is being tested by the regulatory hand of the State. 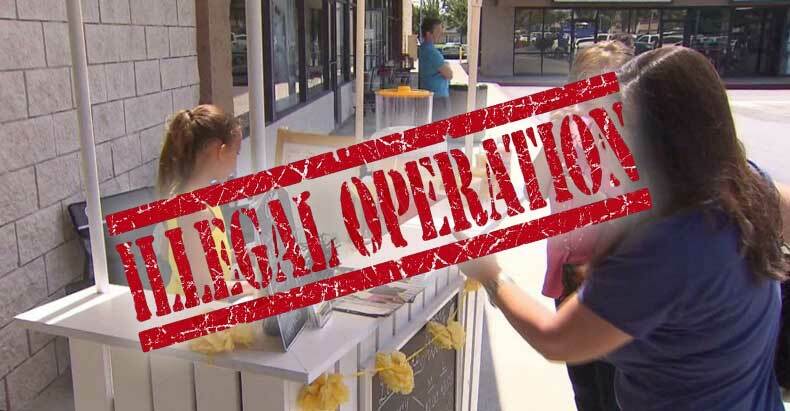 Orange County authorities shut down Annabelle’s “small business” and gave her 30 days to get the proper permit and license. The permit will cost around $200, but in order to secure the permit Annabelle will have to meet a bevy of government requirements – costing $3,500 – just to serve fresh-squeezed fruit juices to thirsty passersby. “1. She needs to upgrade her cart to get it up to commercial standards, in order to pass the inspection. 2. She needs to make the lemonade in a licensed facility. Licensed kitchens require: Liability insurance, a business license, a deposit and an hourly or monthly fee for use. The family has received enormous support after media began telling Annabelle’s story, but in the meantime she has had to “turn down a wedding, corporate events, movies in the park and church events,” according to local KTLA 5. Annabelle had previously set up her stand to help charities such as children’s cancer research and homeless services, but that was put on hold pending government permitting. It’s turning out to be a hard and fast lesson in how government requirements on business – many of which play no role in protecting people or the environment – put a heavy, unnecessary burden on aspiring entrepreneurs. Revenue collection is often the only driver of government permits and licenses. It appears that Annabelle made it through the gauntlet, with the help of many who donated to her GoFundMe account after reading her story. Others are not so fortunate, though.